15th July 2017 - Day 1 .... I was tired and grumpy and our day started while it was still dark. I didn’t particularly want to go as I only managed to grab a few hours of sleep because I was up all night finishing my highly addictive book. So with sleepy eyes I threw on some clothes, burnt my tongue from drinking my coffee too quickly, and in the darkness found the way to our Tuk Tuk to take us south to Okanda. I could see dawn’s light filling the sky as I poked my head out of the little shaking taxi every now and again. Faint outlines of elephants heading toward the jungle treaded over the rice patties in the distance. We arrived to Okanda temple by 5:30am and I pulled myself and my camera bag out of our ride, to be met with a sea of people also waking up for an interesting day. Locals were adorned in hues of orange and white, and bustling about in their morning. Waking up on their mats on the ground and beginning to eat breakfast, preparing for their long day of walking. They were all there for the ancient pilgrimage that is Paada Yaatra. The temple sat in the heart of the area; singing, praying and chanting drifting around it in the morning haze. I picked up my camera and began to shoot. Some faces preoccupied with the religious happenings, some faces smiling into the lens and many just stared at us in simple curiosity as we weaved our way through crowds of local people. We stood out like a sore thumb. Some of these people had been walking for 40 days straight, leaving everything behind but their essentials, to journey some few hundred kilometres on the spiritual walk that is Paada Yaatra. 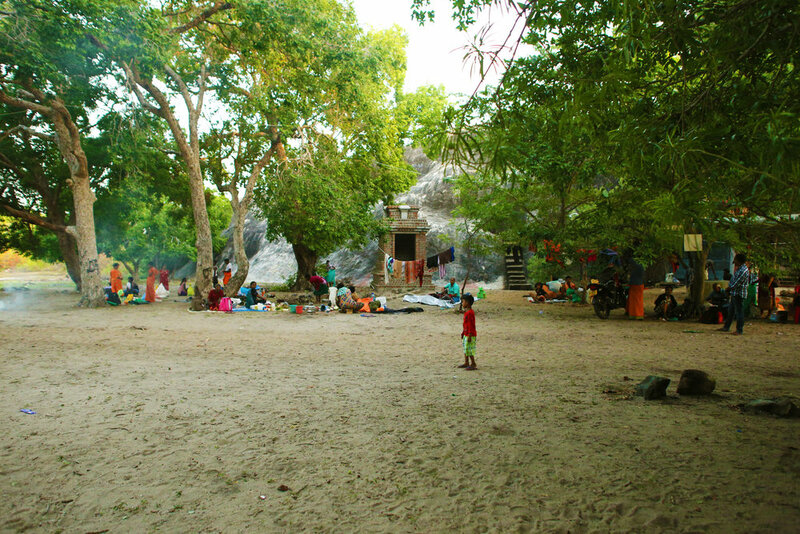 It is an ancient pilgrimage, done entirely by foot that happens every year, beginning in Jaffna, at the top of Sri Lanka, all the way down the east coast, carrying a trail of village devotees who dedicate a few months to reach the end destination at the Kataragama shrine in the remote southeastern jungle. All I knew at the time, was that it was pretty much a huge walk that people undertake for many days, mostly under Buddhist and Hindu religious aspects. I knew that they were opening the gates from Okanda into Yala National Park for the pilgrims that day, which is generally closed off to the public, to start their final leg through the Sri Lankan jungle. I was expecting the temple, the praying and people carrying sacks of rice on their heads. I was expecting the walking, the lively energy and the “Haro Hara’s” that were being shouted, but I was NOT expecting to be participating in this last leg of the journey taking five days through the notorious national park. We bumped into our friend from Colombo who was beginning the walk with some friends of his, although they were going a little off trail for some exploration. Tyler, with his small backpack of last minute supplies he threw in the night before, mentioned that he was thinking about joining the walk, although he was a bit on the fence. He was what you would call semi prepared. Our friend told him that what he had would be plenty, and to go for it! That he would meet plenty of pilgrims along the way who would be generous and welcoming, who would let him sleep by their fire and offer him food. Tyler was leaning towards going; things were looking good. I was impressed by his thirst for adventure but also thought it was a little crazy. Our friend then looked at me with wide eyes and a wide smile. “You too” he said! “To get the full Ramatree experience, you must go!” A small ball of fire started in my belly, and I laughed at him, kind of nervously. “Haha, No, look at me,” I said, pointing at myself pathetically, “I only have the clothes on my back and my camera bag… I can’t go on a five-day walk through the jungle, with wild leopards and elephants and buffalo, under the harsh sun with no sleeping mat or food or …. “ I trailed off thinking about how ridiculous the idea was considering I was so unprepared but also thinking about how it actually would be. But I definitely wasn’t mentally prepared for any of this, which to me would be the biggest part! He laughed at my train of thought and with the best kind of spirit, said, “The best adventures are the ones you are most unprepared for” with a smile on his face like he knew he got me. “It’s a good experience for you” he backed it up with. I had heard this from him before and I knew he was right. I looked at him, not saying anything, an internal conflict happening all over my body. It was one of those really tense, suspenseful moments. I was so torn. The adventurous, spontaneous, courageous side of me was screaming YES and the logical, reasonable side of me was screaming NO. I don’t think I had ever been so blatantly torn in a single moment before. The crowds were moving and most had begun their walk, already well on their way when we were still filling Tyler’s backpack with biscuits and roti’s as I was saying YES, NO, YES in my mind. My tiny leather backpack could only hold what was already in it; a pack of cards, a notebook and a water bottle. Slung over my shoulder was my camera bag. I was way too unprepared for this. I was pacing up and down, trying to calm myself down, when I hurried over to our Tuk Tuk driver and told him that we were going to go, searching his eyes to tell me I was crazy. Or to tell me to go. He only laughed through a warm smile, lightly bouncing the ball back into my court where it sat, waiting for me to pick it up with some intention. Five minutes later, I watched our Tuk Tuk leave in a small trail of dust and I felt sick in my stomach. We began our first steps, I was half laughing, half crying and unsure what to do with myself, other than put one foot in front of the other. This was crazy. Absolute madness. I don't even know where we are or where we are going. I had to run into the forest and empty my bowels. I came out and back onto the path to meet Tyler, I was hot and clammy and already feeling dirty. Okay, this was going to be quite an adventure. He smiled a genuine smile at me, and we have a little unspoken moment before he takes a hold of my hand and we continue walking. I’m already feeling a bit better. There was a truck up along the path where they were handing out water and some Ayurvedic balm for sore muscles. We grabbed what we needed, and as we were giving them thanks, a group of seven locals and one Polish guy, with a wizards sort of hat on, sporting a big walking stick with peacock feathers, rocked up next to us. It’s always hard to tell, but most of them looked only a little older than us, with bare feet, sacks of all sorts thrown over their shoulders, and a ‘Can Do Attitude’ kind of look. We introduced ourselves and explained our situation when they immediately said we could join their group if we wished. Yes please. My saviours. 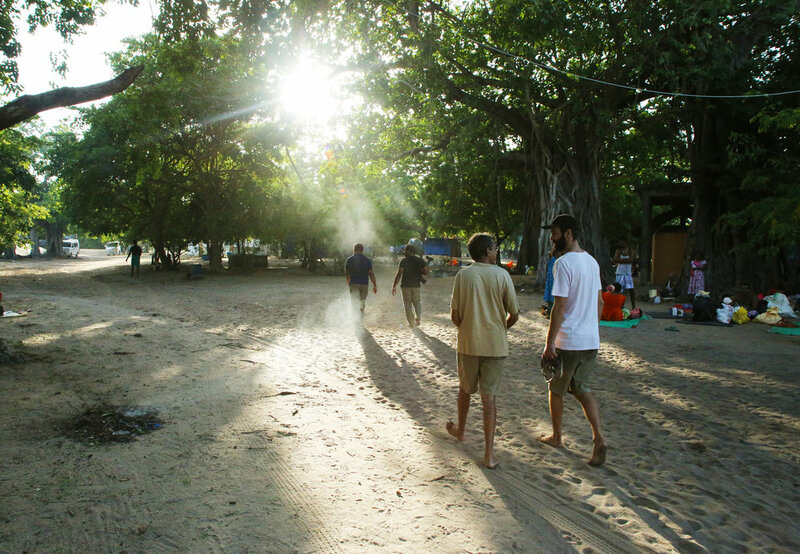 We continued briskly for about half an hour along the dirt road, speaking slowly in English to most of the guys who didn’t understand more than ‘hello’ and ‘my name is…’. But verbal communication didn’t really matter right then, we were all on this walk together, and that was enough of a connection in itself. Shrubs, trees and dry clumps of bushes lined either side of the dirt road, the sun high enough in the sky now to soak our clothes in sweat. The earth was dry and very hot. Up ahead some of the boys had stopped next to the road for a little rest and by the time I sat down, there were two joints being rolled in newspaper, some incense being burnt and a big water jug being handed to me. Okay… excellent, I thought, we’ll get along just fine. Smiles and laughter were shared as well as bush weed with local tobacco. So with a little buzz, we continued walking. For most of the guys we were with, it was also their first time joining the pilgrimage, mostly for religious and spiritual reasons of their own. And I found out later, just to spend some time with the bro's, and do this experience through a part of the country (the national parks) that is normally completely restricted to people. For the first few hours, my feet became dusty in my shoes and around every bend, the dirt road continued the same as before. We passed groups of people every now and again, those taking rest and seeking shade from the sun. An intentional “Haro Hara” being said, sometimes shouted with integrity every time we passed. We began joining the spiritual choir. I asked what it meant exactly, to Brian, one of the Sri Lankans who could speak the best English. “It means the Way of God” and if spoken in the jungle, the animals are aware you are a part of this pilgrimage and will not harm you. Tyler and I reciprocated the saying to everyone we walked past and often between our group as it was said down the line, a little weak at first, but its sort of something you get into the spirit of quite quickly. A huge deer ran across the road in front us, before the path opened up onto a big, flat plain with a huge watering hole in the distance. My shoulders strained from my little bags straps, which were digging into my flesh. We stopped frequently, under trees, sitting cross-legged on the ground, drinking tea and eating oranges, while wild buffalo grazed on the horizon. We watch families walk by with sacks of rice on their head and smiling faces. Not long after our tea break, we continued to walk, only to stop again shortly around the lake. It would be our last stop for water (to cook with) for a while, so we decided to stop for lunch. Parked under the shade, my little orange hemp hat tilted over my face, lying on the ground, I could feel small ants crawling over the lower half of my legs. I didn’t mind. There was a slight breeze and I must have fallen asleep for a little while, because I woke up to a huge plate of rice and beetroot curry (it was delicious by the way) being handed to me. I rubbed my eyes in a sort of daze; the sun was high in the sky and waking up this morning in our little home felt so far away. The sun was getting lower in the sky and I felt much better than I did this morning. Tyler and I kept saying to each other how lucky we were to have found these guys. We realised we couldn’t have merged with a better bunch. It must have been about four o’clock as the trees were making elongated shadows when we took a break for some biscuits and learnt about the importance of intentions on this walk. I thought about this a lot when we continued, my thoughts interrupted by a family of elephants walking across the path up ahead; a sign of good luck apparently. The landscape was becoming more and more barren as we moved further from civilisation and closer to the real jungle. Around the bend, we were welcomed by a surprisingly lush lake holding the most beautiful array of lotus flowers I had ever seen. Sitting still and silent. Dusk was falling and we’d walked a little over 20kms. A good stint I thought. Weaving through mud fields, grassy plains and shrubbery, we spotted two more elephants, one with huge tusks, who sat in their natural habitat oblivious to us walking by. I had picked up a walking stick earlier that afternoon, and all I could hear were my footsteps crunch under the gravel road rhythmically in sync with my stick touching the earth. It was simple and beautiful and alive. We reached the river by nightfall, most had set up camp already, fires burning and sleeping areas arranged. We walked in, I could feel following eyes as we made our way through the ‘campsite’ and to the far corner by the river bank where the sign read ‘Danger - Crocodiles’. Following the boy's lead as we had no other choice, it was here that we let our stuff down with a sigh of relief. The boys were immediately gathering three big stones and piles of sticks for our evening fire. I rolled out the three purple flax mats the boys had carried, each one a little wider than a single bed and sat down. There was a small temple close by, chanting and singing drifting through the evening haze of smoke and into my ears. The huge pot of lentil dhal was cooking and it was time for our ‘shower’. I was dirty and dusty and very sweaty. I only had my pants and my t-shirt that I was wearing, so I rummaged through Tyler’s bag to find something, anything. I pulled out an old sarong, that'll do. I tied it around me, knotting it up above my breasts and removed my clothes underneath. Our new friends walked us a little way down to a ‘safe’ showering spot, with a little net around to look protected from the crocodiles. Okay cool, this is the shower. The boys went in first and with loud noises, splashed around to scare away any crocodiles, or maybe just to make me feel better, I'm not sure. I grabbed a tree root and slid down the muddy bank, and dunked my head under a few times. A bar of soap was handed to me and I had a little wash but was pretty quick to get out again. Sitting by the river that night, eating a vegetarian meal of rice and dhal (also delicious by the way, no joke) I learnt that two of the guys in our group had been ex hunters in Yala National Park, but had veered from that lifestyle. They had recently become vegetarian and had chosen a more ethical and spiritual approach to life. But they knew Yala like the back of their hand. Which was good for us because once we crossed the river in the morning, we were in Yala territory and technically, no man’s land. What they call, the real Jungle. Whilst listening to the story, rose oil was dripped into my hands which I rubbed together and pulled up to my face, took a deep breathe in before putting it through my wet hair. I was just following the boys’ lead. Ahhhhh went my breath. It was dark now, and with full bellies, another amazing scent of the Ayurveda balm filled the air. The boys were rubbing each other’s shoulders and legs to soothe the muscle ache. It sounds weird, but I thought it was cool, they were looking out for each other and I appreciated that. My shoulders even got a little rub, although comparing my little backpack with their huge parcels over their shoulders; I don’t think I quite deserved it. Sweet tea was served with biscuits as I felt warm and cosy and fresh. The stars peeked through the trees above us and we talked about the wonders of nature as incense slowly burned and quills of cinnamon were being passed around to nibble on. The evening felt and smelt and tasted divine. The numbers 3,6,9. In the hush of the night, when most of the people were sleeping, we all sat in a circle on our mats while the boys passed a smoke around the circle. It felt balanced. I slept under the bright stars that night, using my little bag as my pillow. It took me a while to adjust to the hard ground, but I eventually drifted off listening to some of the boys singing very quiet ‘Ohmmms’. I was glad I came.